The major live music happening around town this weekend is punk rock extravaganza Riot Fest, which runs through Sunday at various clubs around town and features bands such as Screeching Weasel, Naked Raygun, Alkaline Trio and The Dead Milkmen. For more information on that, check out loudlooppress.com's excellent preview. - Big Bang TV at Hideout - Per the band's online bio, "Frantic, post-punk guitars stumble in and out of pools of atari synth and turntable chirps. Male/female vocals lazily dance around each other until they’re swept up by a driving break beat and booming bass." Also with Serengeti & Polyphonic and Kid Static. 10 p.m., $8, 21 and over. More info and tickets. - Inchworm at Darkroom - Taking cues from the likes of Neil Young and the Stones, Chicago's inchworm deliver a fresh, memorable take on a classic rock formula. Also with Deanna Devore and Where Astronauts Go to Hide. 9 p.m., $8 advance, $10 at door, 21 and over. More info and tickets. - Van Ghost at Empty Bottle - Chicago-based Americana rock. Check out our recent Q&A with front man Michael Berg here. Also with Nathan Xander and 500 Miles to Memphis. 9:30 p.m., $5 advance, $8 at door. More info and tickets. - Japandroids at Schubas - A Canadian garage rock duo that released their debut LP, Post-Nothing, this year. To learn more, check out this new interview with the duo from Jim DeRogatis of the Sun-Times. Also with Little Girls. 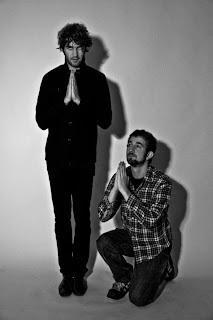 Japandroids are also playing Schubas on Friday, but that show is already sold out. 3 p.m., $12, all ages. More info and tickets. - Lonely, Dear at Bottom Lounge - Otherwise known as Emil Svanängen, Lonely, Dear is a Swedish indie pop mult-instrumentalist. Also with Asobi Seksu and Anna Ternheim. 8 p.m., $15, 18 and over. More info and tickets. - Girl in a Coma at Reggie's - A punk-influenced rock trio made up of sisters Nina and Phanie Diaz as well as Jenn Alva who are signed to Joan Jett's Blackheart Records. Also with Evil Beaver and Black Gold. 5 p.m., $10, all ages. More info and tickets. - The Horrors at Double Door - A British shoegaze/garage rock act that released their sophomore album, Primary Colors, in May. Also with Crocodiles. Doors 8 p.m., show 9 p.m., $15, 21 and over. More info and tickets. It's been a while since I've seen as much energy as Japandroids had on Saturday. So glad I went, and they really seemed pumped about the big turnouts for their "first shows in Chicago." Thanks for the comment. Glad to hear it was a great show!